Video marketing is the most powerful marketing resource available. We help small business owners with solid video marketing strategies to leverage our client's image and presence online, making them trusted authorities in their fields in their region. How do we do that? Identifying the right way to approach their audiences, building the right message and engaging them to take action. All resources are applied, managed and maintained by a complex strategy to not only create/design and record the videos, but also making them interesting for search engines. We can also help you managing lead capture, follow up, auto-responders, marketing campaigns (coupons, promotions, etc). Having just a big fancy brochure website isn’t enough anymore. They are very useful and still required, but if you don't attract your visitors with a defined strategy, engaging them with the proper tools and techniques, they will look at your website and just go away. We will prepare a customized marketing plan, according to your company's needs and keep you and your business on track to meet your goals. 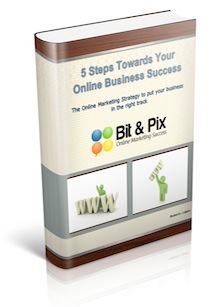 Understand what your business should do to be successful online. Enter your First Name and email in the form beside to receive a totally FREE report "5 Steps Towards Your Online Business Success", describing the most important steps that your company should be taking to be successful online. You will also receive a link to our secret page with some FREE videos and articles that will help you understand how to be successful online using multiple channels, like Social Media, Mobile, Video, etc. You will also understand how important Search Engine Optimization (SEO) is important for your online presence, but not enough to bring you leads. Don't worry, because we will not share your name and email with anyone else. We just send you educational content for FREE, where you will be able to understand how effective your online presence is, and the potential results you will get boosting your online presence.